Here in Paradise Contemporary Art Exhibition takes place in North and South Squares, Sneem from Saturday 31st May to 18th September 2014. Here in Paradise takes place in Sneem’s Sculpture Gardens. The village is unique in as far as it features contemporary art in public space offered to a small community by heads of states, parliaments and private donors. Whatever the reasons for its attraction, no place as small as Sneem shows the depth of migration and interchange in the European Union better. Half of its population is made up of blow-ins, as the Irish call residents from abroad. “The beautiful destination” mirrors and attracts the diversity of its visitors. 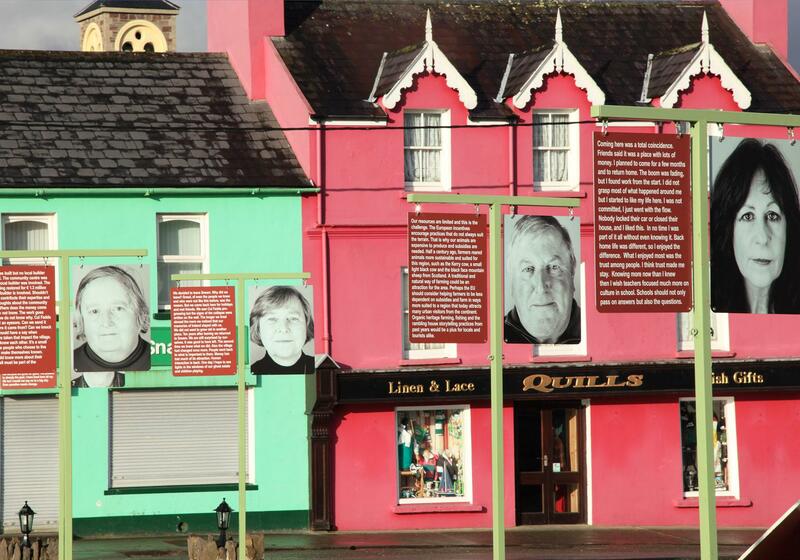 The reason is not as much the sculptures as the people of Sneem: they are speaking sculptures indeed. what would you wish for Cul Fadda (the Ghost estate from the Celtic Tiger years)? what would you wish for Ireland? what would you wish for Europe? Their answers and their photographic portraits, taken by well-known landscape photographer Peter Zoeller www.peterzoeller-photo.com, present a self-portrait of the village. Here in Paradise offers a surprising and often courageous insight into the realities and the visions of contemporary people living, often by choice far from the cities “in a dream”. What stunned the artist was the readiness of so many inhabitants of all ages and backgrounds to make their personal views and ideas public, while the ease of people reflecting on Europe may catch most continental visitors off guard. Initially, the Tidy Towns Committee had hoped for 20 participants but, followingthe spontaneous response, needed to set a limit. © Jochen Gerz, VG Bild-Kunst, Bonn 2014. 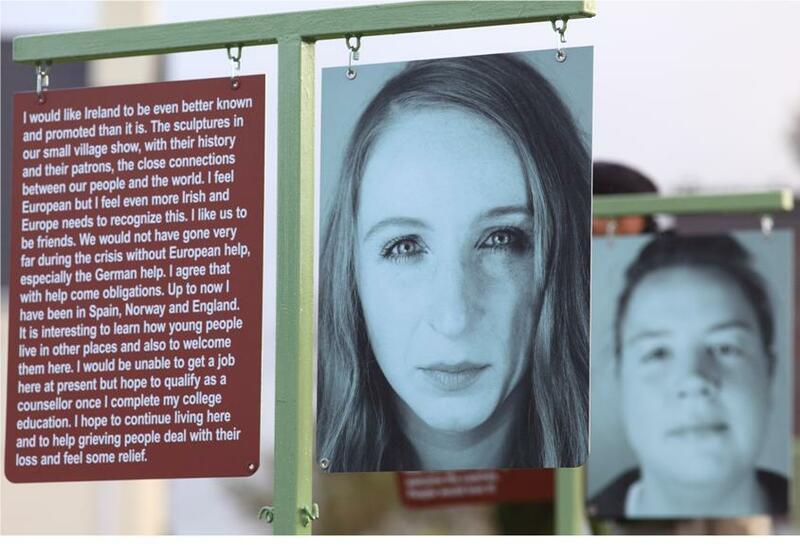 Photography credit: Peter Zoeller, Sneem Please note the statements and photographs of participants are not exhibited side by side. Two years after his well-publicized outdoor exhibition The Eyesore show: Where has the Tiger gone? resulting in the first sale of a ghost estate by NAMA, Here in Paradise continues the public dialogue in the iconic Kerry destination. An international symposium on the public art of Jochen Gerz is to take place at the Irish Museum of Modern Art, Dublin, on November 14-15, 2014. 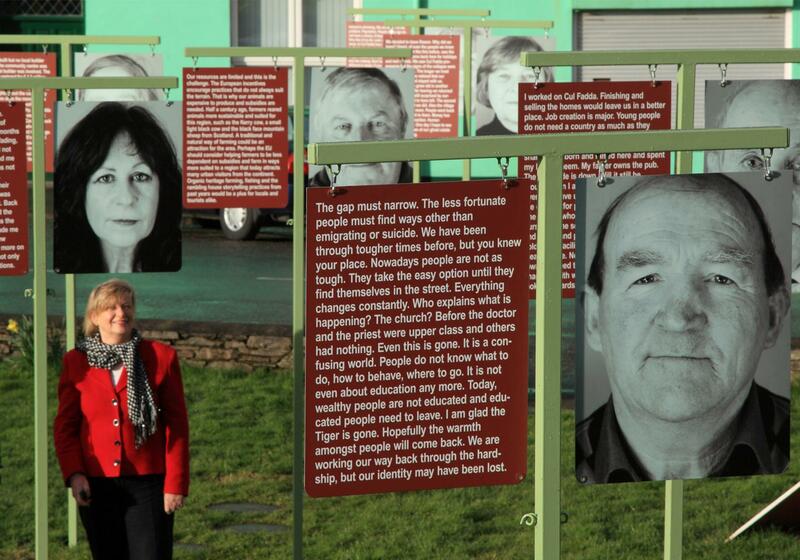 Sneem 2012, The Eyesore Show: Where has the Tiger gone? Winner of the National Tidy Towns Competition in 1987, the village is home to Sneem Sculpture Gardens, a treasure trove of international sculptures featuring work by Vivienne Roche (President O’Dalaigh Memorial), Alan Hall (French President Charles de Gaulle and World champion Steve “Crusher” Casey Memorials), Tamara Rikman (Tree of Light donated by Israel President Chaim Herzog) and a Panda sculpture donated to the State by the People’s Republic of China. 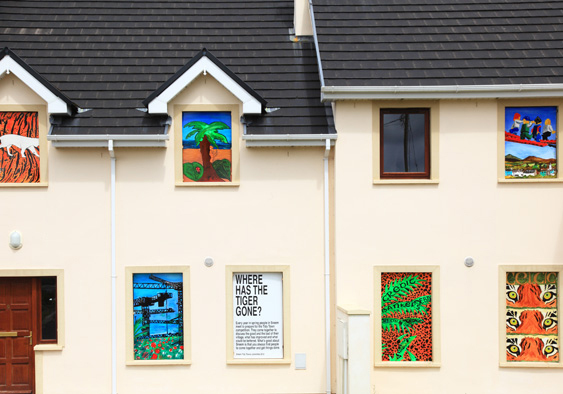 Here in Paradise is commissioned by Sneem Tidy Towns and supported by the French and German Embassies, the Goethe-Institut in Dublin and Kerry County Council.